Be the first to share your favorite memory, photo or story of Madaline. This memorial page is dedicated for family, friends and future generations to celebrate the life of their loved one. 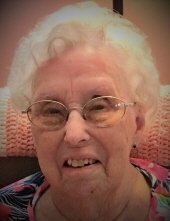 Madaline Doris McAllister, age 96, of Lapeer, died Thursday, March 21, 2019. She was born November 8, 1922 in Flint, to Clyde and Beulah (Rhoads) Taylor. Madaline married Robert John McAllister on August 6, 1949 at the Monroe Street Methodist Church in Lapeer. She worked many years at Lyons & Smiths and Flanigan’s ladies clothing stores in downtown Lapeer. For many years Mr. and Mrs. McAllister attended Trinity United Methodist Church in Lapeer. They enjoyed playing euchre, traveling, vegetable gardening and canning. Mrs. McAllister was talented at crocheting and was an extremely avid reader. She was a kind gentle soul that will be missed by all who knew her. Madaline loved being home with family and friends, they were her prized processions! Mrs. McAllister is survived by her daughter: Lynne Fike of North Branch; daughters-in-law: Ardith Griffin of Lapeer and Vickie McAllister of Columbiaville; grandchildren: Julie, Teresa, Rhonda, Lee Melissa, Ty, Matthew, Kimberly and Sarah; 20 great-grandchildren; dear friend: Nellie Ongena of Lapeer. She was preceded in death by her husband: Robert McAllister; sons: Ron Griffin and Kevin McAllister; son-in-law: Roger Fike; and sister: Virginia Golbraith. Visitation will be 2-3PM Monday, March 25, 2019, at Muir Brothers Funeral Home in Lapeer. Madaline’s funeral service will be 3PM Monday, March 25, 2019, at the funeral home. Pastor Jeanne Wisenbaugh and Pastor Marybelle Haynes will officiate with burial to follow in Stiles Cemetery. Memorial contributions may be made to Residential Hospice, 1681 Woodbridge Park Avenue, Lapeer, MI 48446. Please share condolences and memories at www.MuirBrothersLapeer.com. "Email Address" would like to share the life celebration of Madaline Doris McAllister. Click on the "link" to go to share a favorite memory or leave a condolence message for the family.